As the holiday cheers and festivities begin to wind down, ringing in the New Year is a time for resolutions and healthy lifestyle changes. Many will begin to find their way to the gym and be spending more time exploring the fresh produce section of their local markets, but they may find it difficult to remain faithful to finding seasonal produce that is palatable and fits into their new diet. As we are entering the coldest months of the year many individuals are unaware of the variety of fruits and veggies that are healthy, detoxifying, and satisfying seasonal produce options available to help us get through the dark dreary months and begin to see light at the end of the winter vortex tunnel. Buying local and eating seasonal foods is not only good for you but super beneficial for mother earth. Here are some tips to shining a whole new light and perspective on the heartier and earthier side of your palate and enjoying winter seasonal produce. One of our feet and some ashes, representing the carbon footprint of off-season and non-local produce. When picking seasonal produce going for what is in season vs. what you want can drastically differ in price. Those berries, leafy summer greens, and fresh juicy veggies may look more appealing but they are significantly more expensive and most are bruised, wilted, and limited in selection. Picking the winter produce that is in season (tuberous vegetables, brassicas, and citruses) you will have cheaper prices, a variety in selection, and overall healthier qualities ( flavor, nutrients, and freshness). Have you ever looked at where your produce comes from? If you tend to pick food that is not in season, it’s usually grown in unnatural growing conditions or shipped from far off lands. We are a part of a massive food chain globally exporting and importing goods at huge scales. The farther your food travels the more energy it takes to get to where you are and it decreases in the full flavor and nutrients of the produce. In order for the produce to get to your local market, it means prematurely harvesting the fruits and veggies, refrigerating them, then transporting them by trucks, railroad, or airplanes to prevent the produce from rotting before it gets to you. Many times they will be also sprayed with chemicals to persevere them until they reach the markets. The fruits and vegetables are not fully developing in their natural environment, therefore decreasing the quality of their full flavor and beneficial nutrients. The transportation of produce has a significant impact no only on the flavor and nutrients, but leaves an immense carbon footprint on the planet. 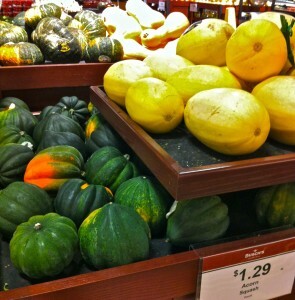 Squash comes in many varieties, keeps well, and is a traditional winter vegetable grown throughout the world. Photo by Deb Nystrom, Wikimedia Commons. The geography and vast changes in climate throughout the United States influences and limits growing seasons in most regions, it can make it very difficult to eat locally and seasonal year round. I know this is easier said than done depending on the region you live, but next time you are at your local market take a look at where your produce is coming from and what is in season. Try to pick produce local sourced from the US vs internationally or grow your own! Check out what seasonal produce you can get locally by visiting local farmer’s markets. 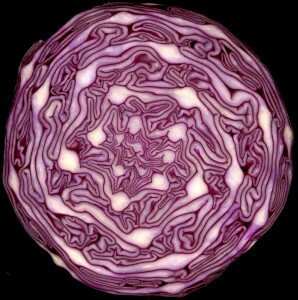 www.localharvest.org is a great website to check where you can find local produce near you. Be open to seasonal vegetables! Although you may have had a bad childhood experience with many winter vegetables, your taste buds change as you age and there are a variety of ways in cooking to bring out different flavors. Who knows you may just find a new favorite! If your curious what’s in season, here are some great links to guide you in buying seasonal winter produce and recipes to enjoy.